The friendship highway, which runs all the way from Lhasa to Kathmandu via Zhangmu – Kodari border has remained the main route for all Tibet-bound trips for many-many years. 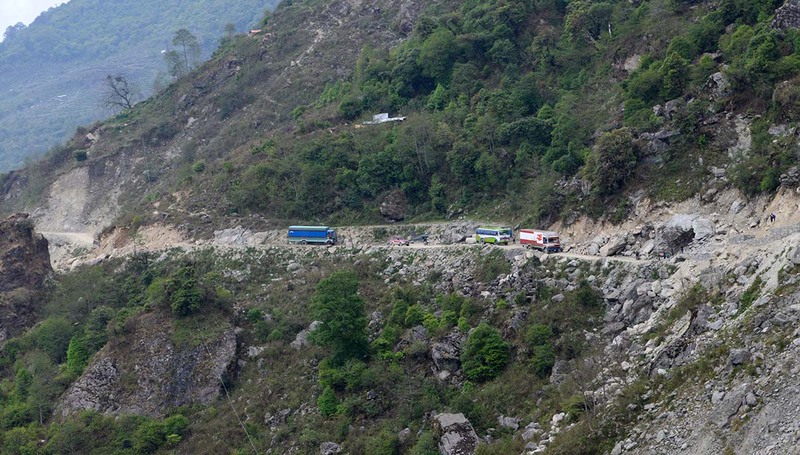 After the massive earthquake on 25th April and the second one 26th April, the highway has been severely damaged closing down the border at Zhangmu – Kodari. Many rumors kept on circling in the market about reopening of the border, and also the possibility of the alternate border being open. Recently, though the news was still not confirmed – the information on the opening of a new border at Rasuwa Gadi & Kyrong for all tourist starting from the July first of 2016 has taken its new heights. The information seems to be more reliable, and accurate than any other pieces of information that had been circulated before. Hence, likewise, our preparation on the same began. In order to get the first-hand experience and get ourselves well prepared for this new route, we decided on the quick trip to the border. 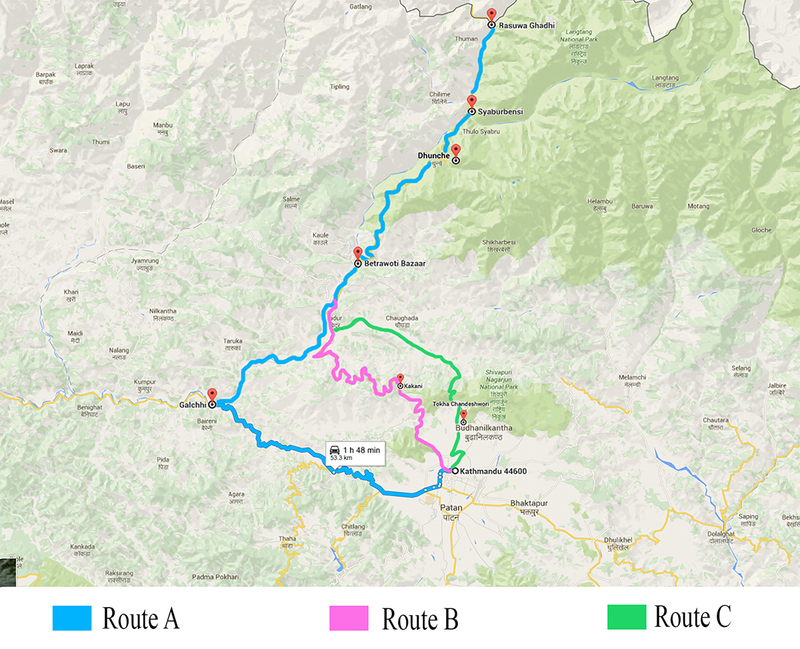 We had three routes to choose from for the route between Kathmandu to Rasuwa Gadi. After gathering the information, we came to a few conclusions that the route A would be the longest while route C to be the shortest. Hence, we decided that we would follow route A from Kathmandu to our destination, but upon returning, we would follow route C. Our team of Sales, Transport & guide were set up for this recce trip and everyone would be making notes of their own experiences. When the day of the trip was confirmed; we all were set to go. On the morning of Saturday 21st May 2016, at around half past eight, in the morning, we began our journey to Rasuwa Gadi. As a plan to follow our route A to the border, we moved on to Kalanki. Being Saturday; public holiday, which attributed to less traffic on the highway, we reached Galchhi within an hour. Leaving Prithivi Highway at Galchhi, we headed towards the north, following the Trishuli River along the Pasang Lhamu Highway. The single lane highway would offer us the scenic beauties of nature with lots of admirable sights of human settlements, en route. Black Topped road made the journey more enjoyable with green fields on both sides. Having said so, our drive had numerous interruption due to the checkpoints by the civil police, armed police force, and army checkpoints. At every checkpoint, our vehicle had to be registered and guards would search our vehicles; for our own safety, of course. After a couple of hours drive, we crossed the Trishuli and reached Betrawati, where we stopped for our vehicle registration. One of our colleagues, then, narrated us the story about Betrawati; its historical importance. Betrawati was once a battlefield when and where our ancestors bravely fought against the incoming Chinese troops and prevented them from entering into Kathmandu Valley, the capital city of Nepal. He would explain that how nature had supported the Nepalese Army in stopping the troops and then the SINO-NEPAL treaty of Betrawati was instigated. Along with the story, we continued our uphill journey, but it was still the narrow single lane road, but black topped to make the journey enjoyable. As we climbed the hill, the beautiful hills and the surrounding villages were lively. We could still see that people were living in tented camps after the earthquake. We reached Kalikasthan at around 12:30 pm, where we had our lunch. This is a small town with a couple of tea stalls where we had the opportunity to have simple meals. Then after driving for about half an hour, we met our first off road track of the day at Ramche. Driving for a couple of minutes on this off road, we encountered our first sight of the landslide prone zone. For years, the landscape of Ramche and Grange has remained famous for all trekkers going to Dhunche to start their trek to Helambu and Langtang. The landscape and road from Ramche, all the way until the end of Grange, were totally off the road. We could see that some vehicles struggling to go uphill due to the mud and slippery road. We had to drive slowly on this route and give as much space as possible for containers and trucks coming on the way. The total distance of this landslide prone zone was around 5 km in distance, but it takes more than an hour for 4WD drive vehicles. Before entering Dhunche, we had to pass through a very strict Army Checkpoint, this is to say because now we are entering to Langtang National Park Office. We had a chat with an officer of the National Park and discussed. 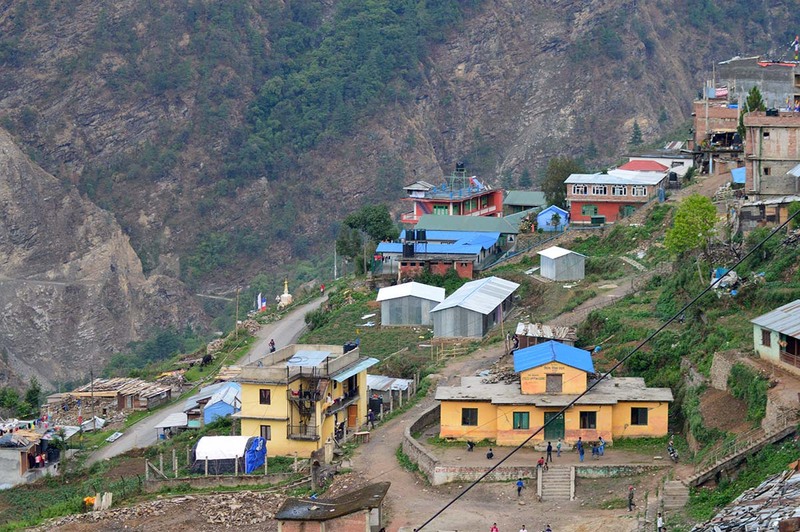 The officer said that as of now they have not received information from the Government of Nepal that tourist who cross the border from the Kyrong – Rasuwa border will not have to pay the Langtang National Park Entry fees. Only the park entry fees for Chinese Tourist, passing through this National Park has been waived off by the Government of Nepal. So until further notice, we do have to make a note of how to handle this Langtang National Park Entry Fees. While entering Dhunche, we could see the peaks of Mt. Langtang through the clouds and again the roads were much better, blacktopped but still single lane only. 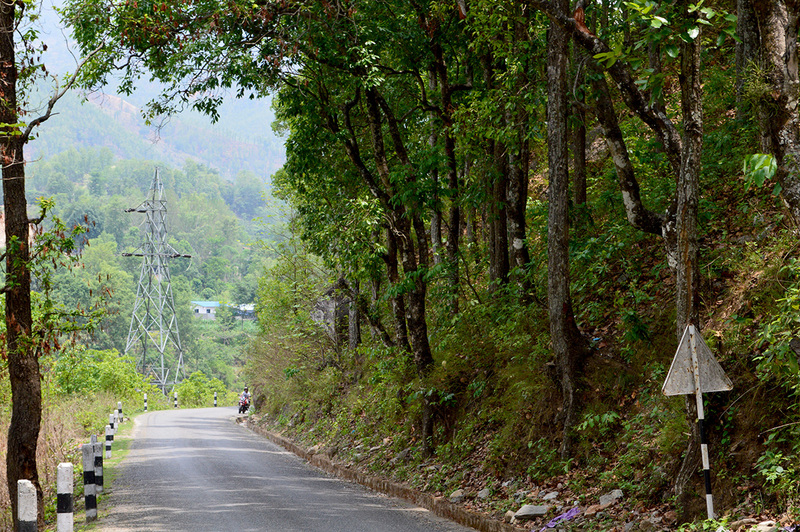 Crossing Dhunche, the drive down the winding road – all the way to Syabrubeshi. From Syabrubeshi, it was another 14 km off road drive all the way to the border. The road, however, was wider and doubled lane, this time. On this route, towards the border, there were a couple of places where we could see the signs of landslides. While we were getting closer to the border, we could see the huge line of containers along the road as well as, parking space below the road nearby the river. It gave us a glimpse of the Tatopani Customs area. At around 16:30 hrs, we reached the border, where we had the chance to wander around and talk to the locals and security guards at the border. The friendship bridge, in between, was not – yet – complete. Though we could see good buildings of Chinese Authorities, on the other side, in Nepalese side, only temporary police-booths are available. As per the security guards, as of now there was only Chinese Tourist is crossing the border, locals of Rasuwa had the permit to cross and visit up to Kyrong in Tibet part. As per information received, now the goods are being crossed in this border apart from the Chinese Tourist, only. A couple of groups of Nepalese guides, cooks, and porters have been allowed to pass through this border. Apart from that, no other nationalities are allowed to pass through. Following route A, we covered a distance of 122 km and it took us around 8 hours, including stops for meals, snacks, and toilet breaks. The portion of blacktopped road of this distance was around 70% and 30% were a rough road. Being Saturday, there was not much movement of containers on the highway and we did not face any traffic, at all. The officers, on the border, had no idea if a tourist is being allowed to pass through starting from 01st July 2016, and they would say unless it was not official, they would not get any valid information, at all. While chitchatting with the local people, they were optimistic that tourist would start arriving and departing from this border like the Zhangmu – Kodari. Already we could see many, many Scorpio Jeeps transferring Chinese Tourist between the border and Kathmandu City. We found out that many people, whose livelihood relied on the Kodari border, had shifted to this one and was waiting for the border to come into life with the business between Nepal and China. Most of them were hoping for the arrival or departure of Foreigners like in Kodari border. All in all, we found that the route between Rasuwa border and Kathmandu was possible with 4WD jeeps and Mini Bus. Haice and Luxury buses would not be suitable to drive on this route. Air Conditioned Vehicle is not possible, at all. As for restaurants, the only tourist standard restaurants we saw on this route was in Galchhi, Dhunche, and Syabrubesi. At Timiure, which is around a kilometer from the border, there are some local restaurants where foreigners could have a cup of tea or coffee. In other places, there are small tea stalls, but not hygienic enough for foreigners. We returned and stayed the overnight at Dhunche. Due to National Park rules and regulation, vehicles are not allowed into the region from 20:00 hrs in the evening till 08:00 hrs in the morning. On 22nd May 2016, we started our drive at around 08:30 am. Since, we did not want to be stuck in the queue of vehicles at the entrance of the National Park, we walked for around 10- 15 minutes to the checkpoint where our vehicle was already cleared to pass. It took us around 2 hours (including half an hour stop for breakfast on the way), to reach Battare. The potter is around 46 km from Dhunche and all downhill. It did not take us a long time to reach Grange and Ramche landslide zone, as we were driving downhill, too. Battare is the point from where we can choose the option of driving the route either via Galchhi, Kakani or Tokha. As per our planning, we had made it previously, we choose the route to Tokha, which was again a single lane road through the town of Battare. After crossing the town of Battare, we drove along the paddy fields on both sides of the highway. Our drive somehow lost its pace due to incoming vehicles. Since the road was narrow, we had to wait and then to let the vehicle from another side pass. But soon, we were driving on the off-road highway track again. As per information received, the Government has already passed the budget to build this highway and blacktop the road, the construction was going on. We may assume that if all goes well, this part of the road will be blacktopped and our driving experience would be smoother and enjoyable. The road, under new construction, looks very wide and double lane. After driving for an hour, or so, in this off-road track, we started to make our climb towards Kathmandu Valley. This road was blacktopped but single lane only. It is a winding road through the forest and a couple of villages en route. Midway through the hill, we found a good location for lunch. It was much clean, and the food served there was delicious. We found this to be the ideal place for lunch with good food and natural surroundings. All in all, we found this route very short but adventurous, and the drive from the border to Kathmandu could be cut short by 2 hours if we drove this highway. The only negative point of this route is the entry point in Kathmandu, the Tokha Village. We do have to pass through the Shivpuri National Park in this route, but foreigners will not have to pay any entry fee for driving through this highway. 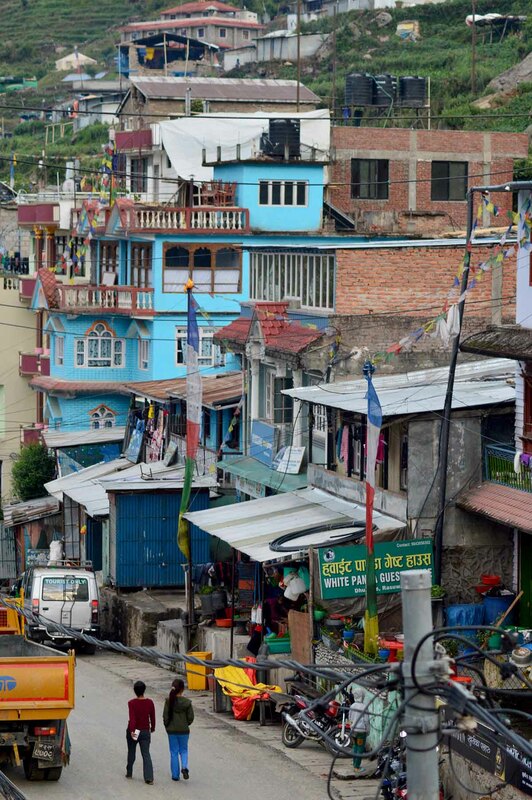 The entry point, Tokha village is one of the oldest villages in Kathmandu Valley and the roads pass through this village. The roads are narrow and make big bus difficult to pass through. But for Jeeps, it would be no problem. Rajju Maskey, Mahesh Chettri, Umesh Chandra Rai, Sanjeev Katwal, and Eknath Bhatta are the narrators of this report. All of us are colleague from the Royal Mountain Travel. 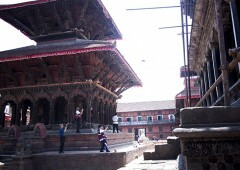 This entry was posted in Nepal by royalmt. Bookmark the permalink.